Summarise results from simulation studies and compute Monte Carlo standard errors of commonly used summary statistics. This package is modelled on the 'simsum' user-written command in 'Stata' (See White I.R., 2010 < http://www.stata-journal.com/article.html?article=st0200>). rsimsum is an R package that can compute summary statistics from simulation studies. rsimsum is modelled upon a similar package available in Stata, the user-written command simsum (White I.R., 2010). The aim of rsimsum is to help to report simulation studies, including understanding the role of chance in results of simulation studies: Monte Carlo standard errors and confidence intervals based on them are computed and presented to the user by default. rsimsum can compute a wide variety of summary statistics: bias, empirical and model-based standard errors, relative precision, relative error in model standard error, mean squared error, coverage, bias. Further details on each summary statistic are presented elsewhere (White I.R., 2010; Morris et al, 2019). The main function of rsimsum is called simsum and can handle simulation studies with a single estimand of interest at a time. Missing values are excluded by default, and it is possible to define boundary values to drop estimated values or standard errors exceeding such limits. It is possible to define a variable representing methods compared with the simulation study, and it is possible to define by factors, that is, factors that vary between the different simulated scenarios (data-generating mechanisms, DGMs). However, methods and DGMs are not strictly required: in that case, a simulation study with a single scenario and a single method is assumed. Finally, rsimsum provides a function named multisimsum that allows summarising simulation studies with multiple estimands as well. An important step of reporting a simulation study consists in visualising the results; therefore, rsimsum exploits the R package ggplot2 to produce a portfolio of opinionated data visualisations for quick exploration of results, inferring colours and facetting by data-generating mechanisms. rsimsum includes methods to produce (1) plots of summary statistics with confidence intervals based on Monte Carlo standard errors (forest plots, lolly plots), (2) zipper plots to graphically visualise coverage by directly plotting confidence intervals, (3) plots for method-wise comparisons of estimates and standard errors (scatter plots, Bland-Altman plots, ridgeline plots), and (4) heat plots. The latter is a visualisation type that has not been traditionally used to present results of simulation studies, and consists in a mosaic plot where the factor on the x-axis is the methods compared with the current simulation study and the factor on the y-axis is the data-generating factors. Each tile of the mosaic plot is coloured according to the value of the summary statistic of interest, with a red colour representing values above the target value and a blue colour representing values below the target. #> Summary of a simulation study with a single estimand. #> Monte Carlo standard errors were computed. 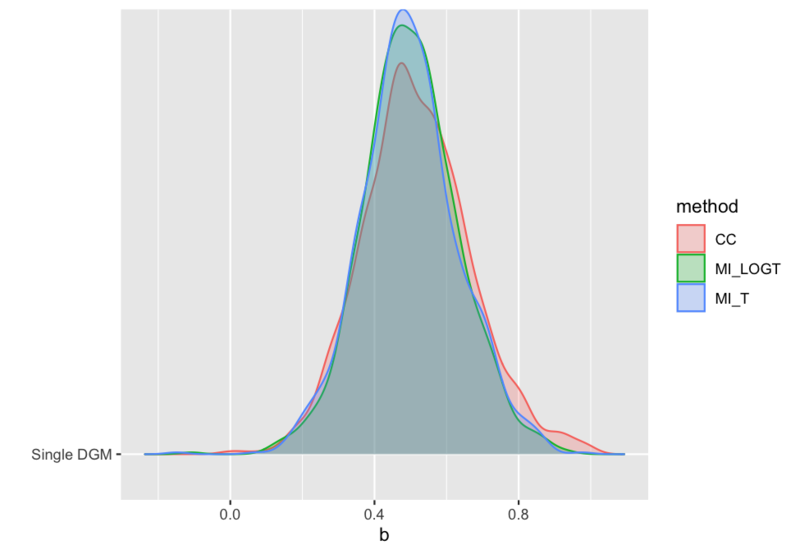 We set x = TRUE as it will be required for some plot types. The plotting functionality now extend the S3 generic autoplot: see ?ggplot2::autoplot and ?rsimsum::autoplot.simsum for further details. #>   Gasparini, (2018). 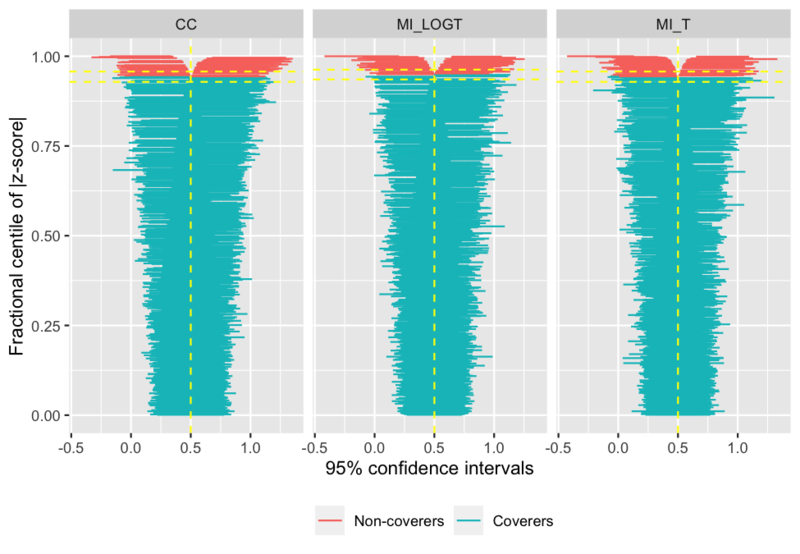 rsimsum: Summarise results from Monte Carlo simulation studies. This is a known issue with RStudio (see #2253). Fixed calculations for "Relative % increase in precision" (thanks to Ian R. White for reporting this). 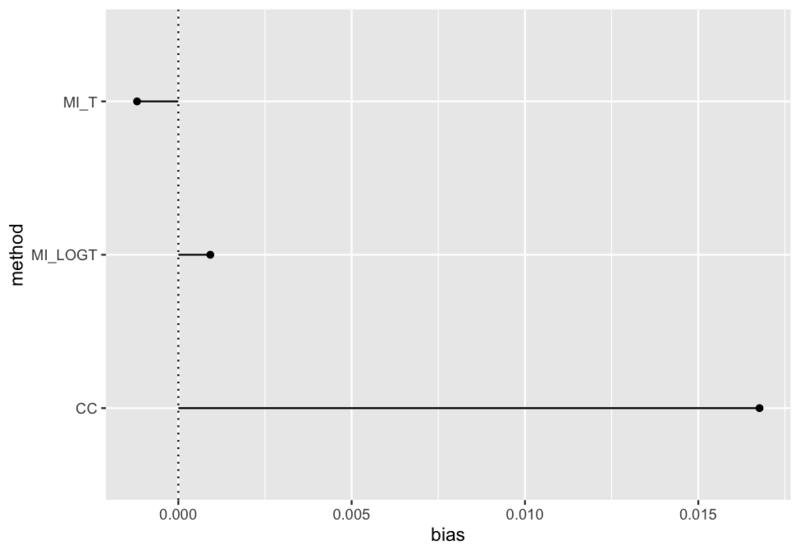 Fixed a bug in autoplot caused by premature slicing of by arguments, where no by arguments were included. Implemented autoplot method for simsum and summary.simsum objects; when calling autoplot on summary.simsum objects, confidence intervals based on Monte Carlo standard errors will be included as well (if sensible). ridgeline plot of estimates, standard errors to compare the distribution of estimates, standard errors by method. Several options to customise the behaviour of autoplot, see ?autoplot.simsum and ?autoplot.summary.simsum for further details. Fixed a bug in dropbig and related internal function that was returning standardised values instead of actual observed values. rsimsum 0.4.0 is a large refactoring of rsimsum. There are several improvements and breaking changes, outlined below. Added comparison with results from Stata's simsum for testing purposes - differences are negligible, and there are some calculations in simsum that are wrong (already reported). Most differences can be attributed to calculations (and conversions, for comparison) on different scales. All plotting methods have been removed in preparation of a complete overhaul planned for rsimsum 0.5.0. The zip method has been renamed to zipper() to avoid name collision with utils::zip(). Updated Simulating a simulation study vignette and therefore the relhaz dataset bundled with rsimsum. rsimsum 0.3.3 focuses on improving the documentation of the package. Improved plotting vignette to document how to customise plots (#4, @lebebr01). Added CITATION file with references to paper in JOSS. Fixed a bug where automatic labels in bar() and forest() were not selected properly. fixed typos for empirical standard errors in documentation here and there. Updated code of conduct (CONDUCT.md) and contributing guidelines (CONTRIBUTING.md). Removed dependency on the tidyverse package (thanks Mara Averick). pattern() now appropriately pick a discrete colour scale for methods (if defined) when the method variable is numeric. updated Visualising results from rsimsum vignette. pattern(), for scatter plots of estimates vs SEs. 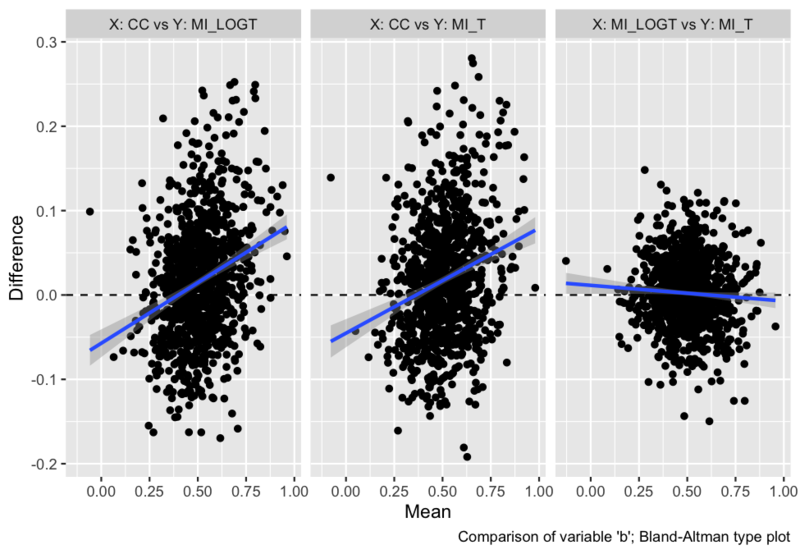 Added a new vignette Visualising results from rsimsum to introduce the above-mentioned plots. Added x argument to simsum and multisimsum to include original dataset as a slot of the returned object. Added a miss function for obtaining basic information on missingness in simulation results. miss has methods print and get_data. Summary statistics that can be computed are: bias, empirical standard error, mean squared error, percentage gain in precision relative to a reference method, model-based standard error, coverage, bias-corrected coverage, and power. Monte Carlo standard errors for each summary statistic can be computed as well.